Today, using WinWerth® measurement software, measurement sequences can be created from 3D CAD data away from the machine. Optimal measurement methods can be determined at the CAD workstation and measurement sequences can be simulated graphically. Programs are thus available prior to the start of production. 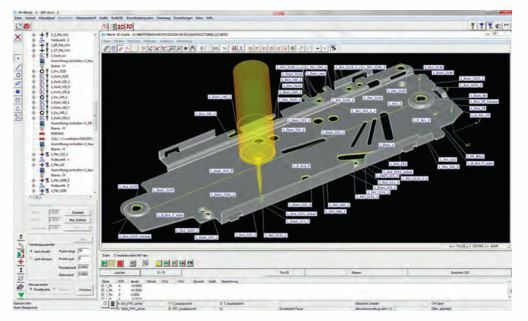 This methodology minimizes the downtime of the measuring machine due to programming work. Even the lighting for the image processing sensor can be programmed using CAD data. For difficult contrasts the lighting settings can be adjusted later in step-wise mode at the measuring machine to suit the work piece properties. Increasing production complexity makes it more and more critical to capture measured objects completely and rapidly using 3D sensor systems. X-ray tomography is good for this, while classical multisensor coordinate metrology is valuable for rapid SPC inspection. The measurement software emphasizes offline programmability and intelligent functions for interactive operation. Regular technical exchange of ideas is important for successful cooperation between the user and the machine manufacturer over the years. Early planning helps to incorporate user requests in the development phase, bringing benefits to both sides.